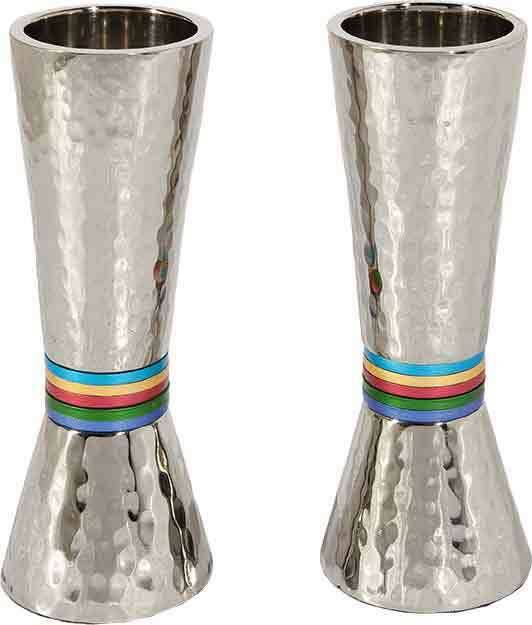 Classic Hammered Candlestick Set with Multicolor Rings. Conical Shaped Candlestick set. A unique new addition to our Shabbat Collection. A beautifully simple style for a display of elegance at parties or ritual use, the hand hammered detailing give it additional charm. The rings on the bottom of the candlesticks adds personality to your table! Also available in with Silver, shades of Blue and Red rings. Measures: 5.5" x 2".